Macmillan Coffee Morning at Prefix! We are hosting a Macmillan Coffee Morning on Friday 29th September 2017 to raise money for Macmillan Cancer Support and invite everyone who can come along to join us! The coffee morning will start at 8.30am and run until 11am so if you're in the area or want to call in to have a chat and support such a great cause, then please do. One in three of us will get cancer, and it will be one of the toughest things we’ll ever have to face. Macmillan's goal is to make sure no one faces cancer alone. They provide medical, emotional, practical and financial support, as well as campaigning for better cancer care. And because cancer affects more than just those facing it, they're there for friends and family too. We will have tea, coffee and a selection of cakes on offer and all we ask is that you support the cause by making a donation of your choice - every penny counts! 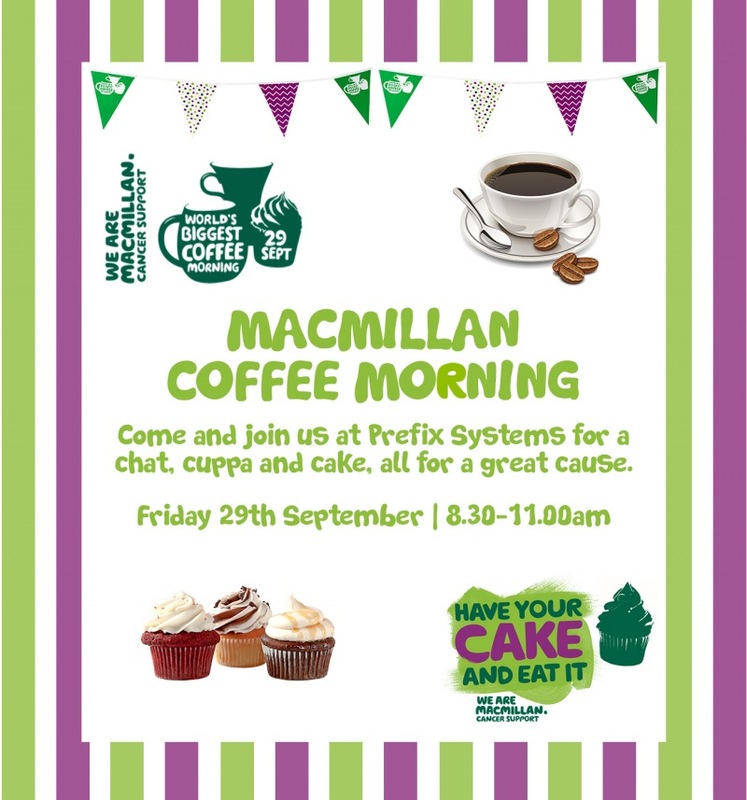 So if you can, please come along to Prefix Systems at our Head Office in Blackburn & enjoy a coffee & cake with us for Macmillan. See you there!